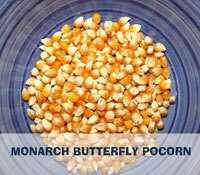 want to eat fresh delicious popcorn with only what you put on it? you've come to the right place, for over thirty years, wisconsin gold harvest has grown and packaged gluten free, non-gmo gourmet popcorn seeds and soybeans. we are the actual farmers, there is no middleman. I’ve been making popcorn on the stove since I’ve been a kid...(long time ago)...I have my own popcorn pans, old fashioned heavy duty pots that are just used for popcorn. I recently got your popcorn as a gift and yours is the best tasting I’ve ever had!...and trust me...everyone who knows me knows I’m a popcorn fiend...I’ll be ordering more!..Joan B. Hawley, P.E. President, Superior Engineering, LLC. try it and see! have a movie night, grab some tasty recipe ideas. ADDITIVES YOU DON'T WANT: Did you know that most microwave popcorn has saturated fat and additives? Popping in a microwave also requires a special metal in the bag so the temperature can get high enough to pop the popcorn. Not to mention toxic flavorings and the volatile adhesives in the bag itself. Even if they call it a natural flavoring it's not natural. It's always best if you can spell the ingredients and know what they are. Popcorn is a whole grain, link here for nutrition information. MIX AND MATCH; Get what you like, we have half lb, one lb, and two lb bags of our varieties. A medium Flat Rate box holds 12.5 lbs, a large Flat Rate box holds 20.5 lbs. We also have bulk quantities. More info on pallet orders here. Favorites of many include Ruby Red, Midnight Blue and our Pearly White. You can't always get them at your grocery store, never mind the soybeans for making your own soymilk and tofu. We have some great recipes for dried soybeans. OXYGEN BARRIER PACKAGING: We package our hybrid and heirloom varieties in oxygen barrier bags so they stay fresh indefinitely. At home we pop in an air popper so nothing interferes with the taste, then add toppings. 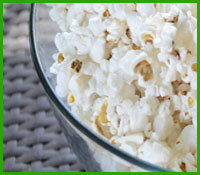 LOW CALORIE WHOLE GRAIN SNACK: For the best popcorn make it fresh on the stove or with an electric popper. It's a whole grain snack with few calories if you only add salt or herbs. Want to get the kids out of their rooms? You'll be a people magnet wherever you are for the smell alone! Link here for info on our hull-less varieties. If kids you know want to do a popcorn project for school, we have pages devoted to students and teachers.